Download "BYLAWS CALIFORNIA STATE UNIVERSITY, DOMINGUEZ HILLS FOUNDATION A CALIFORNIA NON-PROFIT PUBLIC BENEFIT CORPORATION ARTICLE I CORPORATE SEAL ARTICLE II"
2 for Academic Affairs (or his/her designee), the Vice President for Student Affairs (or his/her designee), two (2) faculty members appointed by the Academic Senate, an administrator appointed by the President, a full-time staff member appointed by the Board of Directors, and the President of Associated Students, Inc. In addition, the Board of Directors may appoint individuals to serve as non-voting liaisons for such term(s) as they deem appropriate. Section 2. Section 3. Section 4. Section 5. Section 6. Section 7. Section 8. 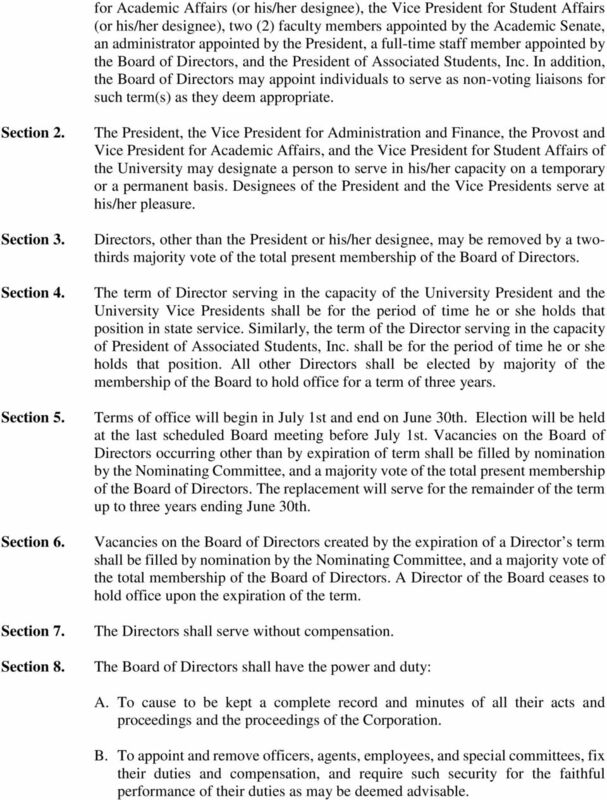 The President, the Vice President for Administration and Finance, the Provost and Vice President for Academic Affairs, and the Vice President for Student Affairs of the University may designate a person to serve in his/her capacity on a temporary or a permanent basis. Designees of the President and the Vice Presidents serve at his/her pleasure. Directors, other than the President or his/her designee, may be removed by a twothirds majority vote of the total present membership of the Board of Directors. The term of Director serving in the capacity of the University President and the University Vice Presidents shall be for the period of time he or she holds that position in state service. Similarly, the term of the Director serving in the capacity of President of Associated Students, Inc. shall be for the period of time he or she holds that position. All other Directors shall be elected by majority of the membership of the Board to hold office for a term of three years. Terms of office will begin in July 1st and end on June 30th. Election will be held at the last scheduled Board meeting before July 1st. Vacancies on the Board of Directors occurring other than by expiration of term shall be filled by nomination by the Nominating Committee, and a majority vote of the total present membership of the Board of Directors. The replacement will serve for the remainder of the term up to three years ending June 30th. Vacancies on the Board of Directors created by the expiration of a Director s term shall be filled by nomination by the Nominating Committee, and a majority vote of the total membership of the Board of Directors. A Director of the Board ceases to hold office upon the expiration of the term. The Directors shall serve without compensation. The Board of Directors shall have the power and duty: A. To cause to be kept a complete record and minutes of all their acts and proceedings and the proceedings of the Corporation. B. To appoint and remove officers, agents, employees, and special committees, fix their duties and compensation, and require such security for the faithful performance of their duties as may be deemed advisable. 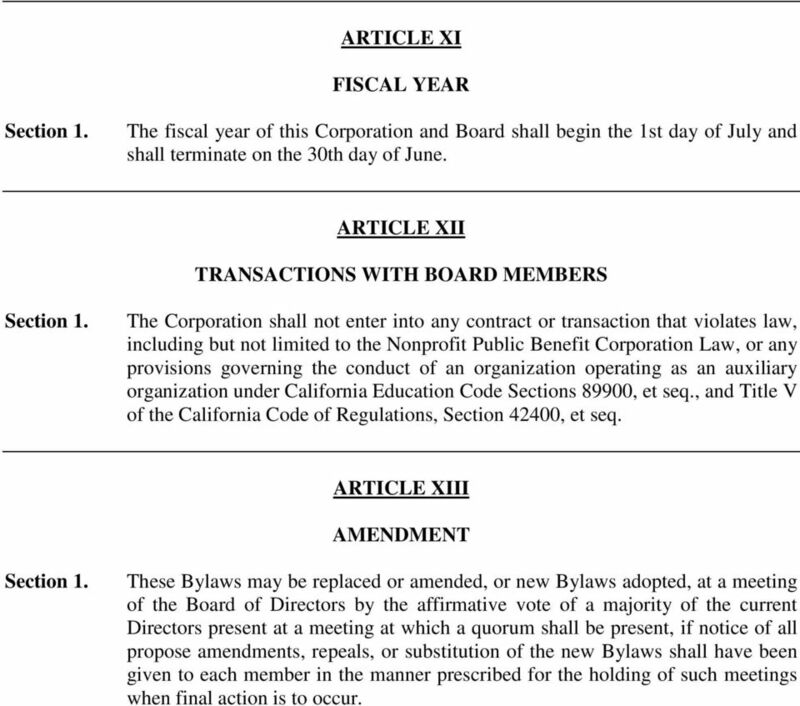 3 C. To manage the business of the Corporation, and to cause to be made for it, rules and regulations not inconsistent with the Articles of Incorporation, these Bylaws, and the laws of the State of California. D. To incur indebtedness for the conduct of business, the terms and amounts of which shall be entered in the minutes of the Board. The Secretary-Treasurer and Executive Director shall sign officially all evidences of indebtedness. E. To supervise all officers, agents, employees, and see that their duties are properly performed. F. To do such other acts as may be authorized by law. Section 9. Section 10. Section 11. Each Director shall file with the Secretary-Treasurer an address to which all notices may be directed until notice of change of address has been given by him or her in writing. Each Director shall have the right at any reasonable time to inspect all books, records, and documents of every kind and the physical properties of the Corporation for a purpose reasonably related to such person's interest as a Director, provided that such Director shall not have the right to inspect those books, records or documents made privileged or confidential by law. This inspection must be made by the Director in person, and the right of inspection includes the right to copy and make extracts of documents. The Corporation shall not make any loan of money or property to or guarantee the obligation of any director or officer unless approved in advance and in writing by the Attorney General. ARTICLE V OFFICERS OF THE BOARD Section 2. Section 3. The Officers of this Board shall be Chair, Vice Chair, Secretary-Treasurer, Executive Director, and Chief Financial Officer. The Chair, Vice Chair, and Secretary Treasurer shall be elected by a vote of the Board of Directors to serve a one-year term. The Executive Director shall be appointed by the Board of Directors, and the Chief Financial Officer shall be appointed by the Executive Director. The Chair shall be the Chair of the Board and shall perform such duties as are usually incident to the office. The Vice Chair shall act in the absence of the Chair, and shall be vested with all the powers of the Chair. 4 Section 4. Section 5. Section 6. Section 7. Section 7. The Secretary-Treasurer shall be the Clerk of the Board, and shall keep all minutes, shall supervise all records, and shall provide for an annual audit of accounts. The Secretary-Treasurer shall record all Bylaws and amendments thereto in a book which will be kept in the principal office of the Foundation. The Secretary- Treasurer will record in that book, the dates of service of the members of the Board of Directors. The Executive Director shall be the Corporation s general manager and chief executive officer and shall supervise, direct, and carry out the programs of the Corporation in accordance with, and subject to, the direction and control of the Board of Directors. The Executive Director shall give, or cause to be given, a notice of all meetings of the Board of Directors. 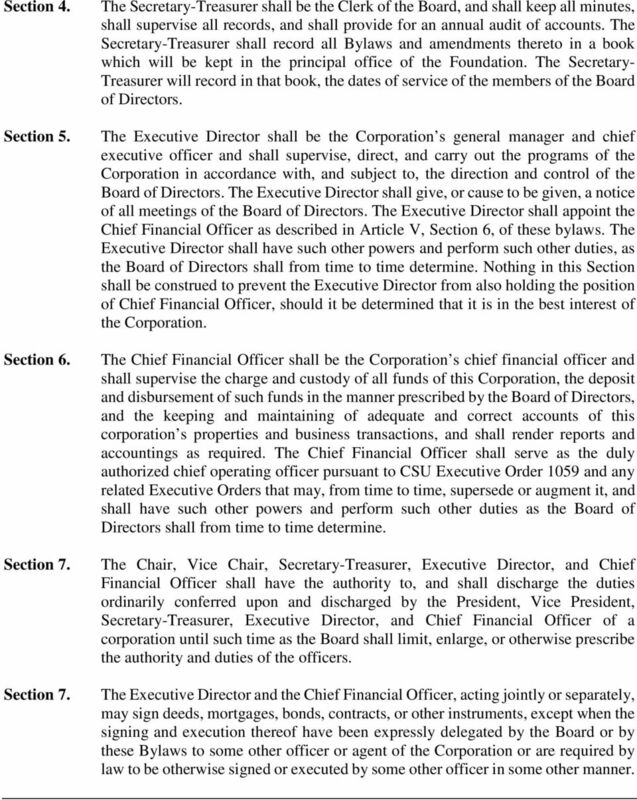 The Executive Director shall appoint the Chief Financial Officer as described in Article V, Section 6, of these bylaws. The Executive Director shall have such other powers and perform such other duties, as the Board of Directors shall from time to time determine. Nothing in this Section shall be construed to prevent the Executive Director from also holding the position of Chief Financial Officer, should it be determined that it is in the best interest of the Corporation. The Chief Financial Officer shall be the Corporation s chief financial officer and shall supervise the charge and custody of all funds of this Corporation, the deposit and disbursement of such funds in the manner prescribed by the Board of Directors, and the keeping and maintaining of adequate and correct accounts of this corporation s properties and business transactions, and shall render reports and accountings as required. The Chief Financial Officer shall serve as the duly authorized chief operating officer pursuant to CSU Executive Order 1059 and any related Executive Orders that may, from time to time, supersede or augment it, and shall have such other powers and perform such other duties as the Board of Directors shall from time to time determine. The Chair, Vice Chair, Secretary-Treasurer, Executive Director, and Chief Financial Officer shall have the authority to, and shall discharge the duties ordinarily conferred upon and discharged by the President, Vice President, Secretary-Treasurer, Executive Director, and Chief Financial Officer of a corporation until such time as the Board shall limit, enlarge, or otherwise prescribe the authority and duties of the officers. 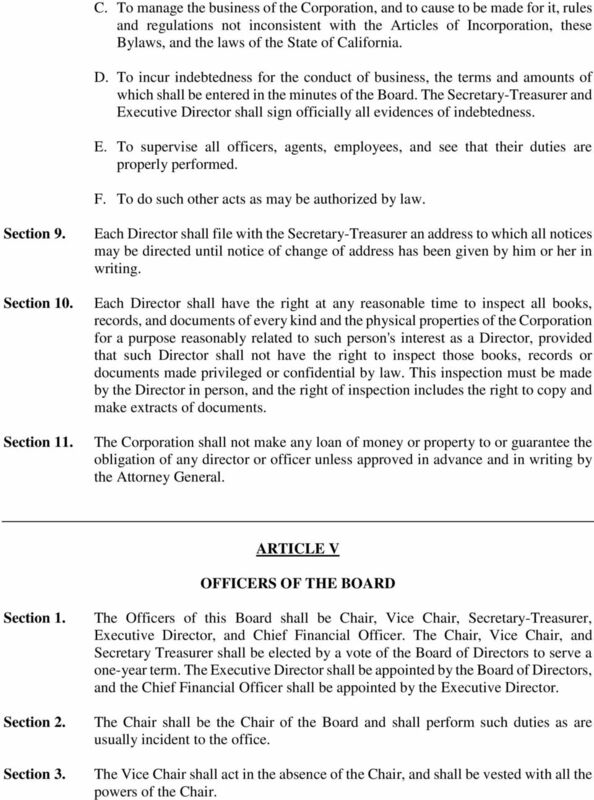 The Executive Director and the Chief Financial Officer, acting jointly or separately, may sign deeds, mortgages, bonds, contracts, or other instruments, except when the signing and execution thereof have been expressly delegated by the Board or by these Bylaws to some other officer or agent of the Corporation or are required by law to be otherwise signed or executed by some other officer in some other manner. 6 days before each meeting. An agenda listing the matters to be considered at each such meeting shall be included in the notice for the meeting. Written notice of any special meeting where final action is not to occur shall be delivered to each Director at least twenty-four (24) hours before such meeting and shall specify the date, time, and place of the special meeting and the business to be transacted. Written notice of any meeting shall also be given to any person or medium who requests such notice in writing. Section 4. Section 5. Section 6. All meetings of the Board of Directors shall be public and all persons shall be permitted to attend any meeting of the Board; provided, however, that the board may hold closed sessions during any meeting to consider those matters that may lawfully be considered in such sessions pursuant to Education Code Section Members may participate in a meeting through use of conference telephone or electronic video screen communication provided all members participating are able to hear one another. The conduct of meetings of the Board of Directors and its committees shall be guided by, but not held to Robert s Rules of Order, and the Board may establish written policy and procedures to implement this Article. Meetings of the Executive Committee may be called for any purpose by any member of the Executive Committee. 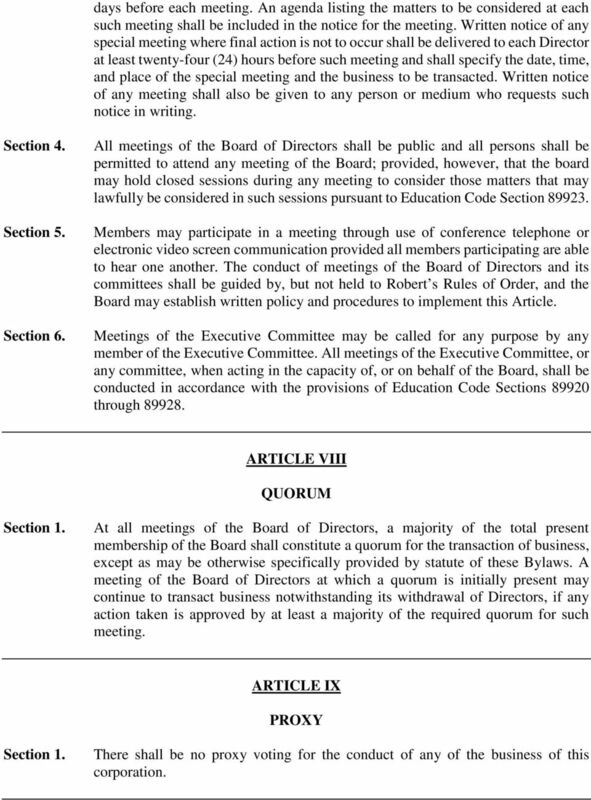 All meetings of the Executive Committee, or any committee, when acting in the capacity of, or on behalf of the Board, shall be conducted in accordance with the provisions of Education Code Sections through ARTICLE VIII QUORUM At all meetings of the Board of Directors, a majority of the total present membership of the Board shall constitute a quorum for the transaction of business, except as may be otherwise specifically provided by statute of these Bylaws. A meeting of the Board of Directors at which a quorum is initially present may continue to transact business notwithstanding its withdrawal of Directors, if any action taken is approved by at least a majority of the required quorum for such meeting. ARTICLE IX PROXY There shall be no proxy voting for the conduct of any of the business of this corporation. 7 ARTICLE X STANDING COMMITTEES Executive Committee This Corporation shall have an Executive Committee, which shall be composed of the Chair, Vice Chair, and Secretary-Treasurer of the Board of Directors and the Chair of the Real Property Development Committee. The fifth member shall be the University President (or his or her designee). At least three (3) of the five (5) members of the Executive Committee shall be community members of the Board of Directors. Section 2. The members of the Executive Committee shall serve for a period of up to three (3) years, or until he or she leaves the Board of Directors or ceases to be an officer, whichever is less. Section 3. Section 4. Section 5. The Executive Committee shall, except when the Board is in session, have all the powers and authority of the Board in the management of the business and other affairs of the corporation. A majority of the members of the Executive Committee constitutes a quorum. Finance and Human Resources Committee This Corporation shall have a Finance and Human Resources Committee, which shall oversee the financial affairs, commercial services functions, and human resources matters of the Foundation, as well as its operating policies and procedures. In addition, the Committee will monitor the Investment Policy for the Long Term Investment Fund and review the performance of internally and externally managed funds. It shall be composed of up to five (5) members consisting of the University Vice President for Administration and Finance, the Corporation s Secretary-Treasurer, and up to three (3) additional members of the Board of Directors to be elected by the Board. One member of the Finance and Human Resources Committee shall be elected by the Committee to serve as the liaison to the Philanthropic Foundation s Investment Committee, whose term as the liaison shall coincide with his or her term on the Finance and Human Resources Committee. 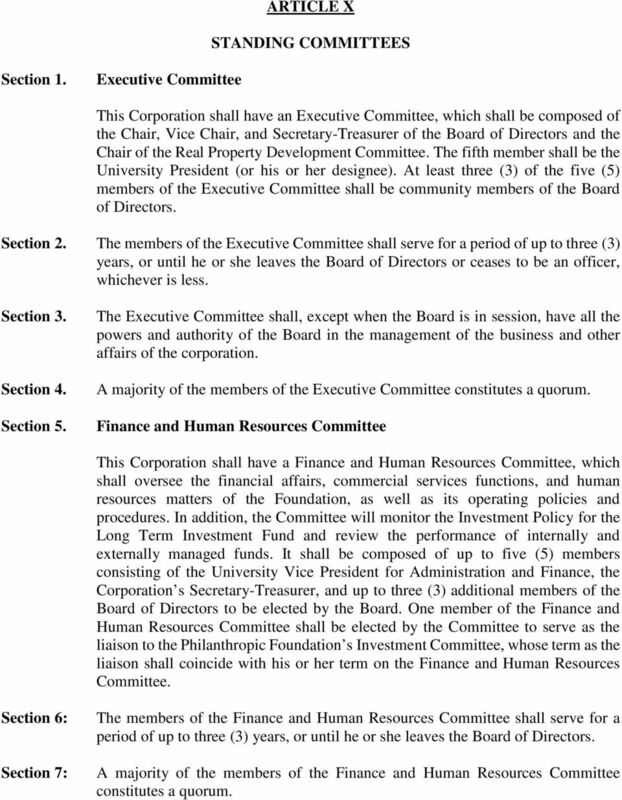 Section 6: Section 7: The members of the Finance and Human Resources Committee shall serve for a period of up to three (3) years, or until he or she leaves the Board of Directors. A majority of the members of the Finance and Human Resources Committee constitutes a quorum. 8 Section 8. Real Property Development Committee This Corporation shall have a Real Property Development Committee, which shall oversee the real estate and real property development affairs of the Foundation. In addition, the Committee shall provide oversight, guidance, and strategic input into management plans and operations for development and entitlement of Corporation land and other real property, review major real estate development pro formas and budgets and recommend approval by Board, and retain advisors, such as outside counsel, real estate consultants and experts, and other advisors, as it determines appropriate to assist it in the full performance of its functions. It shall be composed up to five (5) members consisting of the University Vice President for Administration and Finance and up to four (4) members of the Board of Directors to be elected by the Board. 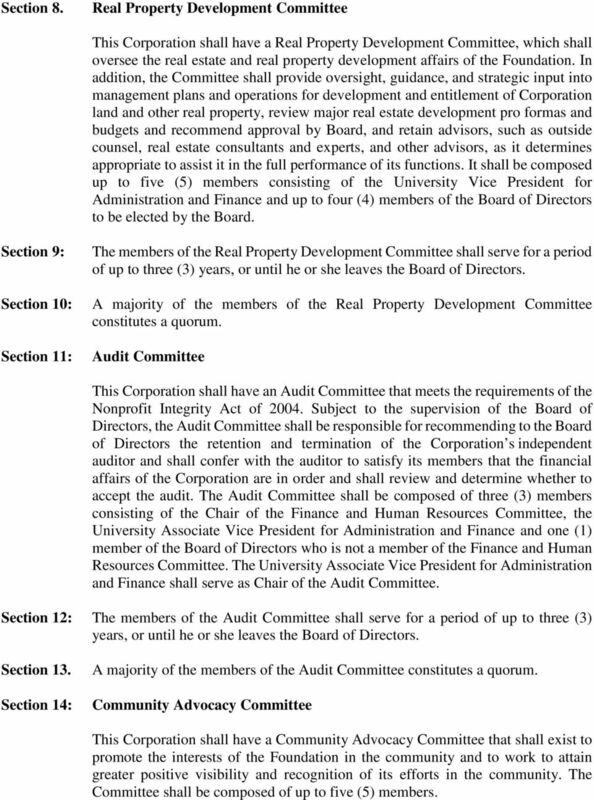 Section 9: Section 10: Section 11: The members of the Real Property Development Committee shall serve for a period of up to three (3) years, or until he or she leaves the Board of Directors. A majority of the members of the Real Property Development Committee constitutes a quorum. Audit Committee This Corporation shall have an Audit Committee that meets the requirements of the Nonprofit Integrity Act of Subject to the supervision of the Board of Directors, the Audit Committee shall be responsible for recommending to the Board of Directors the retention and termination of the Corporation s independent auditor and shall confer with the auditor to satisfy its members that the financial affairs of the Corporation are in order and shall review and determine whether to accept the audit. The Audit Committee shall be composed of three (3) members consisting of the Chair of the Finance and Human Resources Committee, the University Associate Vice President for Administration and Finance and one (1) member of the Board of Directors who is not a member of the Finance and Human Resources Committee. The University Associate Vice President for Administration and Finance shall serve as Chair of the Audit Committee. Section 12: The members of the Audit Committee shall serve for a period of up to three (3) years, or until he or she leaves the Board of Directors. Section 13. Section 14: A majority of the members of the Audit Committee constitutes a quorum. Community Advocacy Committee This Corporation shall have a Community Advocacy Committee that shall exist to promote the interests of the Foundation in the community and to work to attain greater positive visibility and recognition of its efforts in the community. The Committee shall be composed of up to five (5) members. 9 Section 15: Section 16. 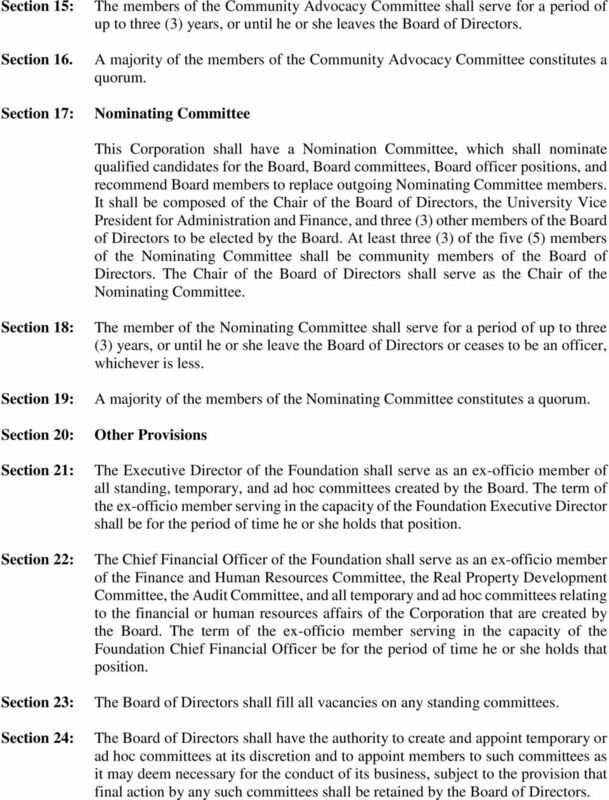 Section 17: The members of the Community Advocacy Committee shall serve for a period of up to three (3) years, or until he or she leaves the Board of Directors. A majority of the members of the Community Advocacy Committee constitutes a quorum. Nominating Committee This Corporation shall have a Nomination Committee, which shall nominate qualified candidates for the Board, Board committees, Board officer positions, and recommend Board members to replace outgoing Nominating Committee members. It shall be composed of the Chair of the Board of Directors, the University Vice President for Administration and Finance, and three (3) other members of the Board of Directors to be elected by the Board. At least three (3) of the five (5) members of the Nominating Committee shall be community members of the Board of Directors. The Chair of the Board of Directors shall serve as the Chair of the Nominating Committee. Section 18: Section 19: Section 20: Section 21: Section 22: Section 23: Section 24: The member of the Nominating Committee shall serve for a period of up to three (3) years, or until he or she leave the Board of Directors or ceases to be an officer, whichever is less. A majority of the members of the Nominating Committee constitutes a quorum. Other Provisions The Executive Director of the Foundation shall serve as an ex-officio member of all standing, temporary, and ad hoc committees created by the Board. The term of the ex-officio member serving in the capacity of the Foundation Executive Director shall be for the period of time he or she holds that position. The Chief Financial Officer of the Foundation shall serve as an ex-officio member of the Finance and Human Resources Committee, the Real Property Development Committee, the Audit Committee, and all temporary and ad hoc committees relating to the financial or human resources affairs of the Corporation that are created by the Board. The term of the ex-officio member serving in the capacity of the Foundation Chief Financial Officer be for the period of time he or she holds that position. The Board of Directors shall fill all vacancies on any standing committees. The Board of Directors shall have the authority to create and appoint temporary or ad hoc committees at its discretion and to appoint members to such committees as it may deem necessary for the conduct of its business, subject to the provision that final action by any such committees shall be retained by the Board of Directors. 10 ARTICLE XI FISCAL YEAR The fiscal year of this Corporation and Board shall begin the 1st day of July and shall terminate on the 30th day of June. 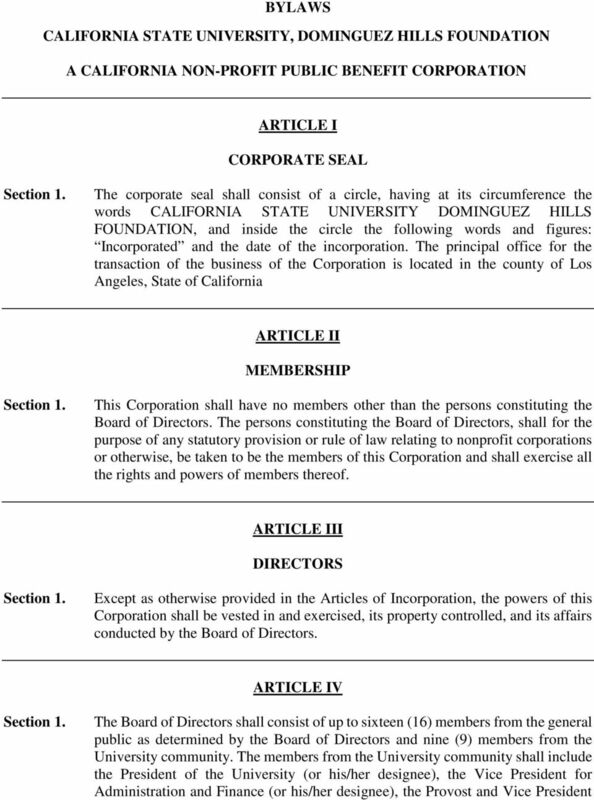 ARTICLE XII TRANSACTIONS WITH BOARD MEMBERS The Corporation shall not enter into any contract or transaction that violates law, including but not limited to the Nonprofit Public Benefit Corporation Law, or any provisions governing the conduct of an organization operating as an auxiliary organization under California Education Code Sections 89900, et seq., and Title V of the California Code of Regulations, Section 42400, et seq. ARTICLE XIII AMENDMENT These Bylaws may be replaced or amended, or new Bylaws adopted, at a meeting of the Board of Directors by the affirmative vote of a majority of the current Directors present at a meeting at which a quorum shall be present, if notice of all propose amendments, repeals, or substitution of the new Bylaws shall have been given to each member in the manner prescribed for the holding of such meetings when final action is to occur. BYLAWS. (A California Nonprofit Public Benefit Corporation) ARTICLE I NAME. NAME. The name of this corporation is Education for Change. 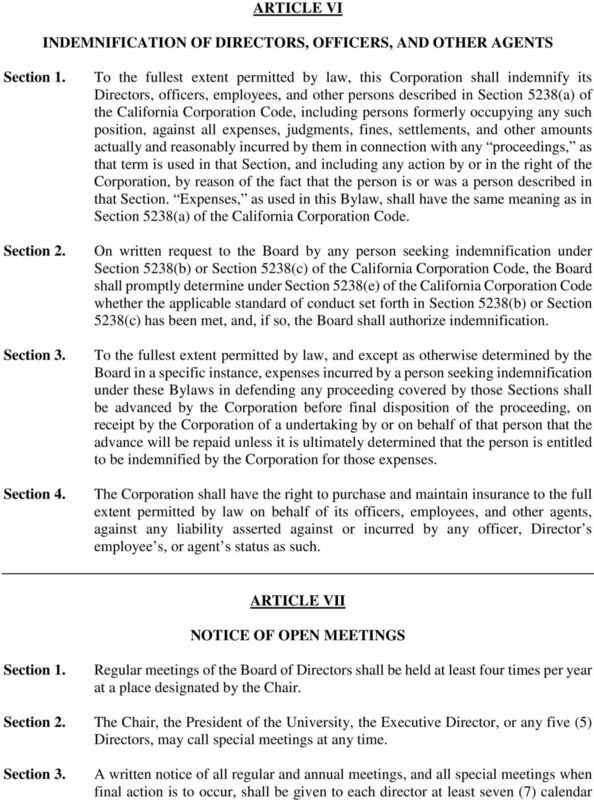 BYLAWS OF SAN JOSE DOWNTOWN PROPERTY OWNERS ASSOCIATION A California Nonprofit Mutual Benefit Corporation ARTICLE 1 NAME The name of this corporation shall be San Jose Downtown Property Owners Association.